Please note that this is Children’s Sunday (for ages birth–12). It is not youth or teen Sunday, nor is this young adult Sunday. Please plan accordingly. This may be one of the most important worship services for which the music and arts department of your church prepares this year. All children’s ministries, including the Children’s area of Christian Education departments, should lead and serve during this Sunday’s worship. It is left to the discretion of the Music ministry leaders to determine the choice and placement of choirs or singing ensembles. Section 4 in this service has special recommendations for choirs with children ranging in age from 4–12. The service itself is designed for music to be provided by a children’s choir (ages 4-12), an adult choir, a young adult choir (ages 19–35), or a teen choir (ages 13–17), along with your dance/mime ministry (see section 5). Be sure to include your mime ministry, drama ministry, step ministry, and all other cultural arts performance groups. Be sure to have testimonies from children within the church with adult supervision. Be sure to have available counselors and related resources to assist children who want help because they have been abused or neglected. Be sure to have present local entities that serve abused and neglected children. Be sure to invite law enforcement officers to attend your service. Clergy: Hear, O Israel: The Lord is our God, the Lord alone. Child: You shall love the Lord your God with all your heart, and with all your soul, and with all your might. Keep these words that I am commanding you today in your heart. Clergy: Recite them to your children and talk about them when you are at home and when you are away, when you lie down and when you rise. Child: Bind them as a sign on your hand, fix them as an emblem on your forehead, and write them on the doorposts of your house and on your gates. Clergy: Even children make themselves known by their acts, by whether what they do is pure and right. Train children in the right way, and when old, they will not stray. Clergy: So that they should set their hope in God, and not forget the works of God, but keep his commandments; and that they should not be like their ancestors, a stubborn and rebellious generation. Child: The wolf also shall live with the lamb, the leopard shall lie down with the kid, the calf and the lion and the fatling together; and a little child shall lead them. (a) Troop’s Prayer. By Percy Gray, Jr.
(b) Everybody Clap Your Hands. By Percy Gray, Jr.
(c) Make a Joyful Noise. By Gerry A. J. Thompson. This selection is an effective anthem-styled song for a children’s choir. (a) Thank You. By Gerry A. J. Thompson. This selection is intended to be sung by children. (b) I Am Somebody. By Gerry A. J. Thompson. This selection is intended to be sung by children. (b) Help Us Grow. By Gerry A. J. Thompson. This selection is intended to be sung by children. 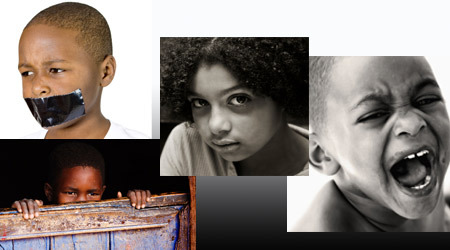 If your church has a media ministry, have the media ministry work with parents and children to do a special media report that includes current statistics of child abuse and neglect especially include the statistics for your city and state. Also include pictures of children who are being loved and protected. Have your Drama ministry prepare a skit dealing with child abuse and neglect. Be sure to not allow really young children to be present during the skit if it is too disturbing. Have your missionary department raise a special offering for either foreign or domestic children’s shelters. African American Heritage Hymnal. Chicago, IL: GIA Publications, 2001. #3. Used with permission and shortened for inclusion in this worship unit. Joshua’s Troop. JT3. Nashville, TN: New Haven Records, 2007.
song for a children’s choir. The First Coast Children’s Choir. Let the Children Sing! Volume IV: Give an Applause. Jacksonville, FL: Anvil Records, 2007. The First Coast Children’s Choir. Let the Children Sing! Volume III: I Get My Praise On. Jacksonville, FL: Anvil Records, 2007. Norwood, Dorothy & The Mississippi Mass Choir. No Request. Jackson, MS: Malaco Records, 2007. Winans, CeCe. Throne Room. New York, NY: Epic Records/Sony, 2003. J. W. Pepper and Sons, Inc.
Walker, Hezekiah and The Love Fellowship Crusade Choir. Family Affair, Vol. II: Live at Radio City Music Hall. New York, NY: Verity, 2002. Walker, Hezekiah and The Love Fellowship Crusade Choir. 20/85 The Experience. New York, NY: Verity 2005. Tribbett, Tye & G.A. Victory Live! New York, NY: Sony/BMG, 2006. G.M.W.A. The Tampa Experience. Inglewood, CA: Gospocentric, 2004. The First Coast Children’s Choir. Let the Children Sing! Volume II. Jacksonville, FL: Anvil Records, 2007. Dillard, Ricky and New G. Unplugged: The Way Church Used to Be. Detroit, MI: Crystal Rose, 2003.